Several impaired bony defects due to atrophy after tooth loss, traumatic events, diseases, or surgical tumor therapy result in defects with different characteristics and challenging three-dimensional constructs. Autologous bone transplantation is considered to be the gold standard to regenerate large bone defects. However, the application of autologous bone transplants is not only limited in quantity but also related to a number of possible complications and patient discomfort., Harvesting the autologous bone causes a second wound and is accompanied by pain, risk of wound-healing complication, as well as increased morbidity. To overcome these disadvantages, several approaches were introduced to enhance bone regeneration. Guided bone regeneration (GBR) is based on the application of non-autologous biomaterial to promote the regeneration within the impaired region., Nevertheless, to achieve adequate bone regeneration, the biomaterials have to comply with several requirements, such as being osteoconductive, being osteoinductive, and promoting osteogenesis. Numerous bone substitute materials of different origins are available in a variety of sizes and structures. Nonautologous natural bone substitute materials include allografts (i.e., human-derived bone substitute materials as well as xenografts, which are derived from different species of animals). Due to their natural origin and comparable structure to autologous bone, naturally derived biomaterials are often privileged. However, naturally derived bone blocks have to undergo strict purification and processing to be suitable for clinical application. In this context, various purification methods, including complex physical and chemical techniques, are used to free naturally derived bone tissue from potential infectious materials such as bacteria and viruses as well as potential immunological components to avoid immunological reaction at the host site or graft-versus-host reaction.,, These methods aim to manufacture a bone substitute material that meets the general requirements and corresponds with the standard guidelines. However, the chemical and physical pretreatment of the donor bone can compromise the biologic properties of the substitute material in terms of damaging the native structure and thus, affecting the biological and mechanical characteristics. Recently, our group analyzed five bone blocks of various allogeneic and xenogeneic origins to assess the histological structure and evaluate the included organic and inorganic components. Three of the five tested bone blocks included, in addition to the extracellular collagen, organic remnants and cellular residues. Moreover, the ultrastructure of the examined biomaterials showed no lamellar substructure for the fully purified xenogeneic block. This finding was associated with its fragile characteristic. In general, in the clinical setting for regeneration of large three-dimensional defects, in addition to the aforementioned biological aspects, further mechanical characteristics are necessary such as biomaterial stability to be screwable and ensure immobilization, which is crucial for the initial phase of bone regeneration., Thereby, novel techniques aim to enhance the mechanical stability of bovine-derived bone blocks introducing a xeno-synthetic bone block, that is, a composite of natural and synthetic bone substitute material. Therefore, the aim of the present article is to analyze the structure of the xeno-synthetic bone block, SmartBone ® (IBI S. A. Industrie Biomediche Insubri S. A. Mezzovico-Vira, Switzerland; distributed by RESORBA ® Medical GmbH, Nürenberg-Germany). Special interest is directed to the ultrastructure as well as the organic and inorganic components. SmartBone ® (IBI S. A. Industrie Biomediche Insubri S. A. Mezzovico-Vira, Switzerland; distributed by RESORBA ® Medical GmbH, Nürenberg-Germany): the bone block is manufactured using a unique production technique. Based on bovine mineral bone matrix and collagen, the block is coated with additional bioactive absorbable polymer and cell nutrients. The resulting composite is a xeno-synthetic highly stable bone block. As stated by the manufacturer, the biodegradable polymer enhances the mechanical stability of the bone block and prevents premature resorption in the 1st month after augmentation. The cell nutrients support cell adhesion and colonization of the block after application. Moreover, SmartBone ® exhibits pores and a microstructure that favor cell colonization. The biomaterial is certified to comply with the quality management system ISO 9001:2008. Four SmartBone ® (IBI S. A. Industrie Biomediche Insubri S. A. Mezzovico-Vira, Switzerland; distributed by RESORBA ® Medical GmbH, Nürenberg-Germany) blocks were used for this study. Following the previously described standardized preparation methods,,, the blocks were decalcified for 4 days at 37°C in Tris-buffered 10% ethylenediamine tetra-acetic acid (EDTA; Carl Roth, Karlsruhe, Germany). Thereafter, the samples were dehydrated and processed in a series of alcohol and xylene with decreasing concentrations using a preprogrammed tissue processor (TP1020, Leica Biosystems Nussloch Gmb). Subsequently, the samples were embedded in paraffin. Using a rotatory microtome (Leica RM2255, Wetzlar, Germany), four slices of 3–4 μm in size were cut and fixed on polarized specimen slides. After deparaffinization in Xylol and rehydration in alcohol, the samples were stained by hematoxylin and eosin, Azan, and Masson-Goldner's trichrome. Furthermore, specific histochemical staining tartrate-resistant acid phosphatase (TRAP) was performed to assess the presence and activity of osteoclasts. The histological analysis was performed in the Frankfurt Orofacial Regenerative Medicine laboratory as previously described. Three of the authors (AO, SG, and SA) analyzed the biomaterial independently. Light microscopy with a Nikon Eclipse 80i microscope (Nikon, Tokyo, Japan) was used for the histological evaluation of the material to analyze the ultrastructure of the biomaterials as well as its organic and inorganic components. A microscope-connected DS-Fi1digital camera and a DS-L2 digital sight control unit (both from Nikon, Tokyo, Japan) were used to capture high-quality microphotographs. The aim of the present study was to analyze the structure and components of a xeno-synthetic bone substitute material, SmartBone ®. Histological analysis showed a composition of inorganic as well as organic components. The extracellular bone matrix showed calcified trabecular structure with preserved lamellar substructure. Small extracellular bone matrix fragments were found within the inter trabecular area [Figure 1]a. In addition, organic remnants in terms of connective tissue-like structures as well as cellular remnants were evidenced within the inter-trabecular region [Figure 1]b. Some of the haversian canals contained no organic material, whereas other haversian canals were filled with connective tissue-like organic structures [Figure 2]a. Moreover, the bone block included organic components within the osteocytes lacunae. There were some osteocytes lacunae that were free of any organic material. However, several osteocyte lacunae were filled with cellular residues [Figure 2]b. TRAP staining showed no TRAP-positive mononuclear cells or multinucleated giant cells. Recently, our group analyzed the structure of five commercially available bone blocks histologically. Three of five bone blocks included further organic materials in addition to the components stated by the manufacturer. Therefore, we classified the examined bone blocks in four categories according to their structure and composition. This classification extended from fully purified bone blocks to bone blocks with preserved organic and cellular remnants, respectively. Accordingly, the fourth category included bone blocks with preserved lamellar structure, organic remnants within the osteocyte lacunae, as well as organic and cellular structures within the inter-trabecular room. Furthermore, our group recently analyzed a bone block of allogeneic origin. The results showed a trabecular structure with maintained lamellar substructure. However, this bone block also exhibited organic remnants within the osteocyte lacunae as well as the inter-trabecular area and was classified in the fourth category. According to our standardized method for analyzing biomaterials, this study aimed to analyze the structure of a xeno-synthetic bone block of bovine origin, SmartBone ®. Thereby, special interest was directed to the composition of this bone block and the presence of organic and inorganic components. The results showed a trabecular structure with preserved lamellar substructure. Some of the haversian canals were free of organic material, whereas others included connective tissue-like structures. Moreover, organic remnants in terms of extracellular matrix as well as cellular residues were found within the intertrabecular area. In addition, some of the osteocyte lacunae exhibited cellular residues. On the basis of these results, the present bone block fits in the fourth category. It must be mentioned that not all the haversian canals and osteocyte lacunae included organic materials. According to the previous and the present findings, it is obviously not yet possible to purify xenogeneic materials in such a way as to manufacture a block with preserved trabecular and lamellar structure and preserve specific extracellular matrix (i.e., collagen selectively) without including further cellular remnants. The manufacturer stated the use of different sterilization methods, without further information about the used techniques. The present results show the presence of further organic remnants within the bone block. In this context, it is uncertain to what extent these structures could affect the clinical outcomes. In the clinical setting, especially for the augmentation of three-dimensional defects, material stability is essential for clinical handling. The present bone block is reinforced with a bioresorbable polymer to enhance the stability and delay the resorption. However, this material also exhibits a trabecular and lamellar organization. Thus, it has to be further investigated whether the material stability is related to the resorbable polymer or to the preserved native material structure. In addition, bone blocks are already used in clinical cases. Clinical cases investigated the use of allogeneic bone blocks as an alternative to autologous bone transplantation to reduce patient morbidity, and could evaluate these materials as equivalent to autologous bone. A case report showed the application of SmartBone ® in a successful reconstruction of the zygomatic bone. The successes of these biomaterials could be due to the included collagen, as collagen was described to provide stability in bone formation by serving as a scaffold for cells and minerals involved in the regeneration process. Thus, no immunological or rejection reaction in the clinical cases. However, to date, there is no information about which purification level is needed for a safe and optimal regeneration process. Thereby, the question arises on whether including organic structure is actually beneficial to fully purified bone blocks and whether the organic remnants will have any influence on the regeneration process in short- and long-term observation. Moreover, it has to be critically questioned whether clinicians should accept the organic remnants within these bone blocks. 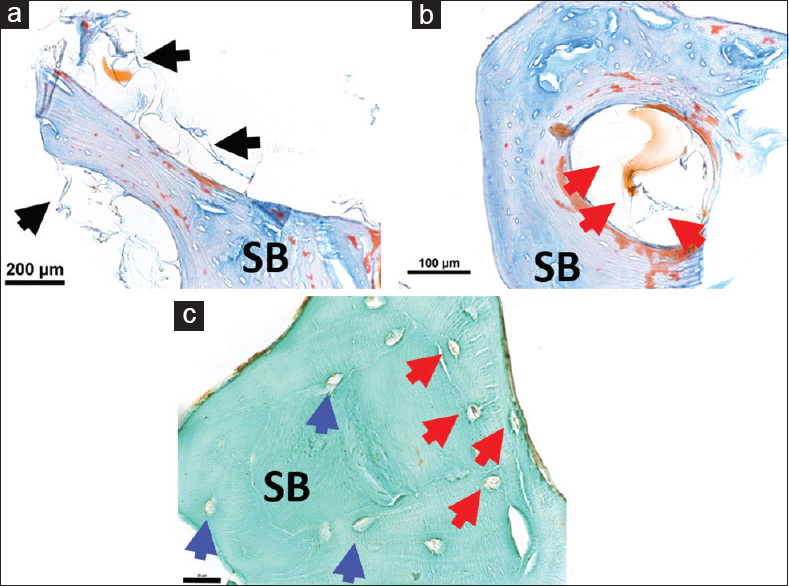 The present outcomes call for alternatives to regenerate challenging three-dimensional bone defects without autologous bone. Accordingly, further studies are needed to evaluate the outcomes of the present biomaterial as well as further safe regenerative alternatives to reduce patient morbidity. We histologically analyzed the structure and composition of the xeno-synthetic bone block, SmartBone ®. The results showed a stable calcified extracellular bone matrix with trabecular organization and lamellar substructure. Moreover, organic remnants were found within the haversian canals, osteocyte lacunae, as well as the inter-trabecular region. On the basis of these findings, the question arises on whether including organic remnants could affect the regeneration process and new bone formation, or even lead to an immunological reaction. The present findings call for alternatives for three-dimensional bone regeneration. Thus, further controlled clinical studies are needed to evaluate bone blocks that include organic remnants in terms of stability and regeneration capacity to determine to what extent including specific organic components such as collagen could be beneficial for bone regeneration. Thereby, it is still questionable whether clinicians should accept the organic remnants within bone blocks. The authors would like to thank Mrs. Verena Hoffmann for her excellent technical assistance. This work was partially funded by Marie Curie Actions under EU FP7 Initial Training Network SNAL 608184. This research was funded solely by the authors' own research funds. Younger EM, Chapman MW. Morbidity at bone graft donor sites. J Orthop Trauma 1989;3:192-5. Damien CJ, Parsons JR. Bone graft and bone graft substitutes: A review of current technology and applications. J Appl Biomater 1991;2:187-208. Barbeck M, Udeabor S, Lorenz J, Schlee M, Holthaus MG, Raetscho N, et al. High-temperature sintering of xenogeneic bone substitutes leads to increased multinucleated giant cell formation:In vivo and preliminary clinical results. J Oral Implantol 2015;41:e212-22. Ghanaati SM, Thimm BW, Unger RE, Orth C, Kohler T, Barbeck M, et al. Collagen-embedded hydroxylapatite-beta-tricalcium phosphate-silicon dioxide bone substitute granules assist rapid vascularization and promote cell growth. Biomed Mater 2010;5:25004. Welniak LA, Blazar BR, Murphy WJ. Immunobiology of allogeneic hematopoietic stem cell transplantation. Annu Rev Immunol 2007;25:139-70. Ferrara JL, Levine JE, Reddy P, Holler E. Graft-versus-host disease. Lancet 2009;373:1550-61. Angaswamy N, Tiriveedhi V, Sarma NJ, Subramanian V, Klein C, Wellen J, et al. Interplay between immune responses to HLA and non-HLA self-antigens in allograft rejection. Hum Immunol 2013;74:1478-85. Ghanaati S, Barbeck M, Booms P, Lorenz J, Kirkpatrick CJ, Sader RA. Potential lack of “standardized” processing techniques for production of allogeneic and xenogeneic bone blocks for application in humans. Acta Biomater 2014;10:3557-62. Pandey RK, Panda SS. Drilling of bone: A comprehensive review. J Clin Orthop Trauma 2013;4:15-30. Walenkamp MM, Goslings JC, Beumer A, Haverlag R, Leenhouts PA, Verleisdonk EJ, et al. Surgery versus conservative treatment in patients with type A distal radius fractures, a randomized controlled trial. BMC Musculoskelet Disord 2014;15:90. Barbeck M, Udeabor SE, Lorenz J, Kubesch A, Choukroun J, Sader RA, et al. Induction of multinucleated giant cells in response to small sized bovine bone substitute (Bio-oss™) results in an enhanced early implantation bed vascularization. Ann Maxillofac Surg 2014;4:150-7. Wenz B, Oesch B, Horst M. Analysis of the risk of transmitting bovine spongiform encephalopathy through bone grafts derived from bovine bone. Biomaterials 2001;22:1599-606. Pruss A, Perka C, Degenhardt P, Maronna U, Büttner-Janz K, Paul B, et al. Clinical efficacy and compatibility of allogeneic avital tissue transplants sterilized with a peracetic acid/ethanol mixture. Cell Tissue Bank 2002;3:235-43. Murayama Y, Satoh S, Oka T, Imanishi J, Noishiki Y. Reduction of the antigenicity and immunogenicity of xenografts by a new cross-linking reagent. ASAIO Trans 1988;34:546-9. Kolácná L, Bakesová J, Varga F, Kostáková E, Plánka L, Necas A, et al. Biochemical and biophysical aspects of collagen nanostructure in the extracellular matrix. Physiol Res 2007;56 Suppl 1:S51-60. Schlee M, Dehner JF, Baukloh K, Happe A, Seitz O, Sader R, et al. Esthetic outcome of implant-based reconstructions in augmented bone: Comparison of autologous and allogeneic bone block grafting with the pink esthetic score (PES). Head Face Med 2014;10:21. Grecchi F, Perale G, Candotto V, Busato A, Pascali M, Carinci F, et al. Reconstruction of the zygomatic bone with Smartbone ®: Case report. J Biol Regul Homeost Agents 2015;29:42-7. Mizuno M, Fujisawa R, Kuboki Y. Type I collagen-induced osteoblastic differentiation of bone-marrow cells mediated by collagen-alpha2beta1 integrin interaction. J Cell Physiol 2000;184:207-13.